Fresh Ingredients for a Fresh Start! 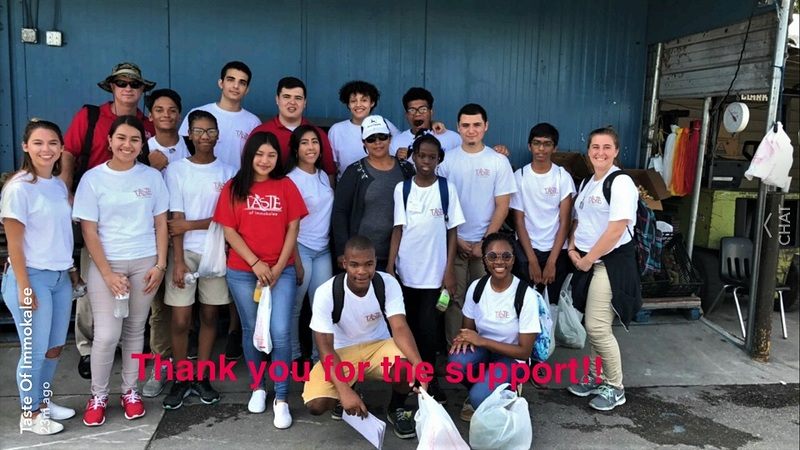 On June 27th, 2017, the Taste of Immokalee Team climbed onto a bus and took a trip down the road to the Immokalee Farmerâ€™s Market. This was a unique experience for most of the team as they walked around the little market. The different stands specialized in different produce. For example, one of the stands had a bunch of baskets full of mangos while another had ten bags of limes hanging from the roof. Some of the produce from the market wasnâ€™t from Immokalee but rather imported. John Slusar walked around with a group of interns that included Alexis Del Debbio, Amy Lopez, and Elizabeth Stephen. They all walked around, and they questioned a gentleman where his watermelons were from. The vendor responded that the watermelons were brought in from Georgia. As the group rounded the corner, they came upon a stand with little fruits. These fruits looked like sea urchins plucked from the ground. The team ventured up to the stand to investigate. Alejandra was a kind woman who worked at this stand. The team talked about Taste of Immokaleeâ€™s mission and she listened. She was very interested in helping them out with their mission. She saw the curious group eyeing the peculiar fruits and smiled happily when a thought came to her mind. She walks up to the team and starts talking to them. 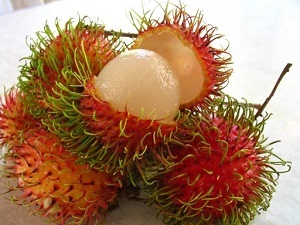 She ended up donating six rambutans to the group for them to use. They were so happy that Alejandra was willing to help with their cause. They all smiled and took a picture with her. Walking back to the stand, the team turned to Myra. She began to talk to the team about how to get to the good part beneath the hard exterior. The group separated once again into smaller sections. Alexis Del Debbio and Amy Lopez venture over to another stand with limes. Omid Ghazizadeh, an intern from Naples, was dared by Juan Gomez and Ian Almodovar to eat a habanero pepper. His face turned bright red as he took a huge bite out of the tiny pepper. 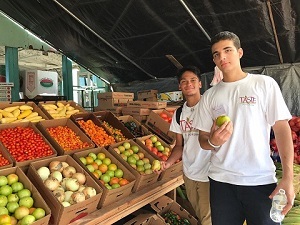 The Taste of Immokalee team had an amazing time at the Immokalee Farmerâ€™s Market. The market was so colorful with all of the vibrant fruits and vegetables. There were coconuts still on the branch in a box as the vendor hacked at them. He used a machete to detach the coconuts from the branch to hand to his customer. The team paraded around the market. Amy Lopez amongst many others like Ian Almodovar and Myra Jaimes spoke personally to the vendors around the market. The team was gathering necessary information about the produce in Immokalee. They asked a question about what fruits and vegetables were in season and what produce is year-round. It was amazing to see fresh produce. The team was so happy to see all of the fresh ingredients, very eager to use it.